Uniquely located in the heart of Europe's last great wilderness, the Peneda-Geres National Park, this delightful charming villa overlooks the river Cávado and the peaceful Caniçada dam. Among the breath-taking forests, the translucent cascading waters and the unforgettable sights. Gerês is one of Portugal’s more attractive Natural Regions, considered by UNESCO to be a World Biosphere Reserve. The villa has a lovely atmosphere and displays a pleasing range of carefully chosen furnishings to provide comfort for guests. It is set within a private walled garden where a stylish swimming pool was recently added. A comfortable sitting room opens onto a shaded terrace overlooking the pool, with table and chairs perfect for outside eating. This property is set on a private condominium of around 4 hectares of land surrounded by protected land due to the environmental interest of this location. Besides the villa, guests have the right to use the communal facilities including a large swimming pool and large lawns with with panoramic views. Various activities can be enjoyed due to the natural setting with nature activities such as fishing, canoeing, water sports and hiking. The Cavado river, with its clear, clean water, is about a 7 minute walk from the villa. There is a restaurant in the nearby village centre (about 1,600 metres away) which produces good local food. Other facilities in this location includes a cafe / bar and minimarket. The larger and historic village of Vieira do Minho is only 4 kms. away. Situated in Albufeira do Ermal (Santa Marta - Rossas) and approximately 10 kms from the villa, Ermal Cable Park is a teleski cable wake park offering a wide range of skis: mono-ski; biped - ski; or ski with a plank as well as a boat to transport people who may fall along the way. Ground floor: Well equipped kitchen opening onto a very spacious terrace with a barbecue area including bread / pizza oven. Guest toilet, living area with comfortable seating and sat tv, dining area with table seating up to 8 people and doors opening onto a large terrace with superb uninterrupted views overlooking the Cavado river valley. Laundry room with washing machine. First floor: Master double with ensuite shower room and doors opening onto a balcony with superb views over the valley. Another double bedroom with door opening onto the same balcony. Third bedroom with double bed. Shower room to be shared by bedroom 2 and 3. 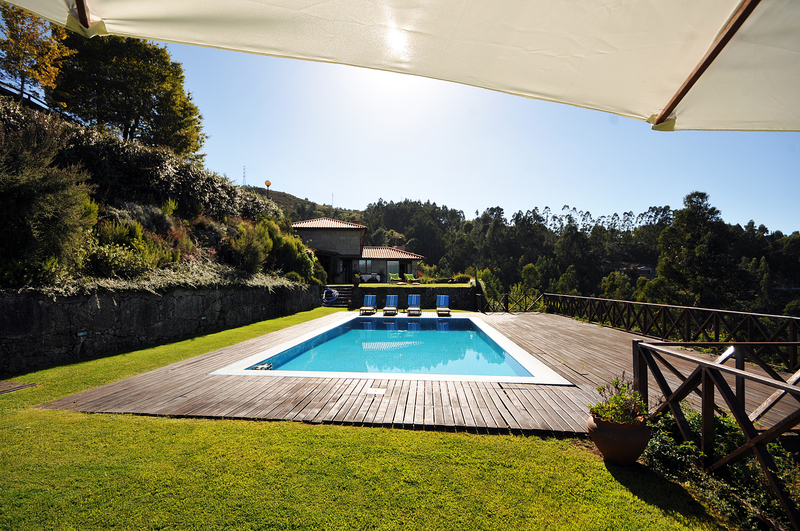 Exterior: Private swimming pool (10 metres long and 5 metres wide). Pool side shower. Large built-in bbq area and terrace with table and chairs for outdoor dining. The views from the terrace and house are outstanding. Wireless internet free of charge. A 450 Euro refundable breakages deposit will be taken at the time of check-in and returned on departure. CENTRAL HEATING IS PAID EXTRA: 300 Euros per week.